There are seven species of rose found outside of cultivation in Minnesota, four native and three introduced. 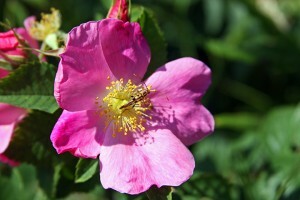 Prairie rose (Rosa arkansana), a native species, is common in the state. It is found in full sun in sandy or gravelly soil on upland prairies, hill prairies, woodland edges and openings, thickets, roadsides, and railroad rights-of-way. It is a low plant, rarely getting more than 18″ tall. Its large, showy flowers appear from early June to early August. Prairie rose is identified by the short stature; the stems often dying back in the fall; flowers borne at the tips of current year herbaceous stems; prickles evenly distributed throughout the plant, even on new growth; leaves with usually 9 leaflets; and flowers in clusters of 3 to 8. Many authorities recognize two varieties of this species. Their ranges overlap and both are found throughout the state, though their exact distribution has not been mapped. Rosa arkansana var. suffulta, the eastern variety, is identified a hairy leaflet undersurface. The leaflet undersurface of Rosa arkansana var. arkansana, the western variety, is hairless. This entry was posted in Plants and tagged prairie rose, Rosa arkansana on April 20, 2015 by John Valo.